Julian was last seen on Tuesday 18 November 2008. Police are concerned for his safety and welfare. Sturt Police (SA) are seeking the assistance of the public in locating missing man Julian Rapadas. Julian was last seen in the western suburbs on Tuesday 18 November 2008. 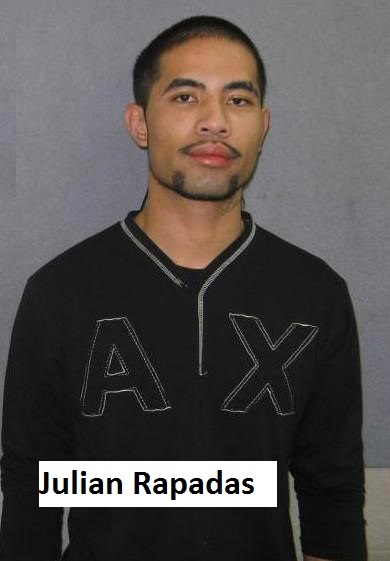 Julian is described as Asian, aged 23 years, slim build, 175cms, 65 kgs, short black hair shaved at sides, light trimmed moustache and black goatee beard. He has the name “Belinda” tattooed on the left side of his neck in cursive writing. Police are concerned as to his whereabouts and ask anyone who has seen Julian, or who has any information regarding his whereabouts to call BankSA Crime Stoppers on 1800 333 000. The attached photograph was taken on 13 August 2008. In relation to the disappearance of Mr Julian Rapadas, Sturt Police recovered a stolen Holden Calais sedan in an inner Adelaide suburb during the evening of January 16. Police would like to thank the public for the rapid response which led police to the location of this vehicle believed to have been used by Mr Rapadas. Mr Rapadas however is still missing and police still have serious concerns as to his whereabouts. Police are seeking assistance from members of the public to help locate him. Anyone with information about the whereabouts of Mr Rapadas is urged to contact BankSA Crime Stoppers on 1800 333 000. And remember, you can remain anonymous if you wish. Police have called for the public's help to find an Adelaide man who has been missing since late last year. Twenty-three-year-old Julian Rapadas was last seen around November 18. Police are searching for a red or maroon coloured Holden Commodore Calais with the registration plate BB8 70P. A warrant was issued for Rapadas' arrest last month when he failed to appear in court on drug and firearms charges. Police say there are serious concerns for his safety. The Disappearance of Julian Rapadas has been declared a Major Crime by SA Police. Julian Rapadas 23 years of Brooklyn Park was last seen on Tuesday 18 November 2008. He has not spoken with any of his family or friends since that time. His motor vehicle was located on Friday 16 January 2009. These mounting circumstances combined with other information give police serious concerns for his safety and welfare. Any person knowing the whereabouts or Mr Rapadas’ movements from 18 November 2008, are asked to contact BankSA Crime Stoppers on 1800 333 000.